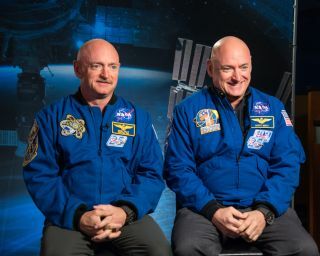 Astronaut twins Scott (at right) and Mark Kelly participated in NASA's Twins Study while (and after) Scott spent close to a year in space. NASA's Twins Study just hit another major milestone. The long-term investigation of Scott Kelly's health after nearly a year in space shows that the early findings from 2017 were valid — with some new insights into possible health issues for future Mars travelers. The astronaut spent 340 days on the International Space Station in 2015 to 2016, along with Russian crewmate Mikhail Kornienko. The milestone flight was the longest single flight of any American, providing investigators an opportunity to see how human health changes in nearly a year. "The perfect nature versus nurture study was born," NASA officials said in a statement. A year in space is a long time by today's standards, but investigators are preparing for future flights to Mars. That journey would likely take an astronaut close to three years. Seeing how Scott's body reacted will provide one data point, but more information on the long-term health effects of space is needed before the journey can be made. So far, investigators know that bones and muscles weaken, fluids shift and in some cases, astronauts return with permanent eyesight changes. Countermeasures are being investigated. Scott's telomeres — or the ends of chromosomes that shorten as people get older — got a lot longer in space. This finding was known in 2017, but investigators confirmed it and also discovered that most of the telomeres got shorter again within two days of Scott's landing. About 7 percent of Scott's genes may have longer-term changes in expression after spaceflight, in areas such as DNA repair, the immune system, how bones are formed, hypoxia (an oxygen deficiency in the tissues) and hypercapnia (excessive carbon dioxide in the bloodstream). The other 93 percent of his genes quickly returned to normal. Scott had no significant cognitive performance decline in space after one year, compared with Mark or with typical astronauts who fly a six-month mission. Investigators did, however, see pronounced decreases in Scott's cognitive speed and accuracy after he landed. This might have happened because of "re-exposure and adjustment to Earth’s gravity, and the busy schedule that enveloped Scott after his mission," NASA officials said. The researchers also saw that spaceflight is linked with nutrient shifts, oxygen deprivation stress and more inflammation. They gathered the evidence after looking at "large numbers" of proteins (chains of amino acids), cytokines (substances secreted by cells in the immune system) and metabolites (substances related to metabolism) in Scott's body. "All of these findings are being integrated and summarized by the research teams; researchers are also evaluating the possible impact that these findings will have on future space travel beyond low Earth orbit," NASA officials said. More details will be released in an integrated summary paper that will be published later this year. NASA stated that "a series of smaller papers grouped by related research areas" will also be disclosed at a later time.